Anyone who knows us is well aware we’re Scandi-obsessed, and we’ve welcomed the heightened presence of Scandinavian cafes and nordic restaurants across the UK capital. 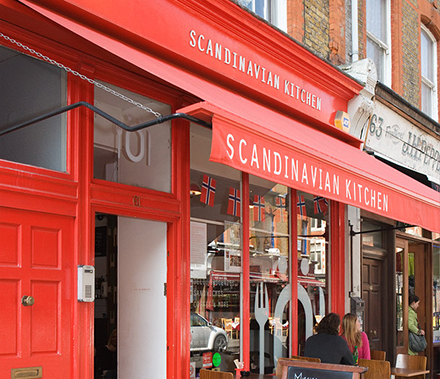 Whether you’re a totally smitten scandiphile like us, a Hygge hedonist or just a bit partial to embracing ‘Fika’ each day, here’s sexton/seksten (16) little sanctuaries of all things Scandi in London that we’ve found. 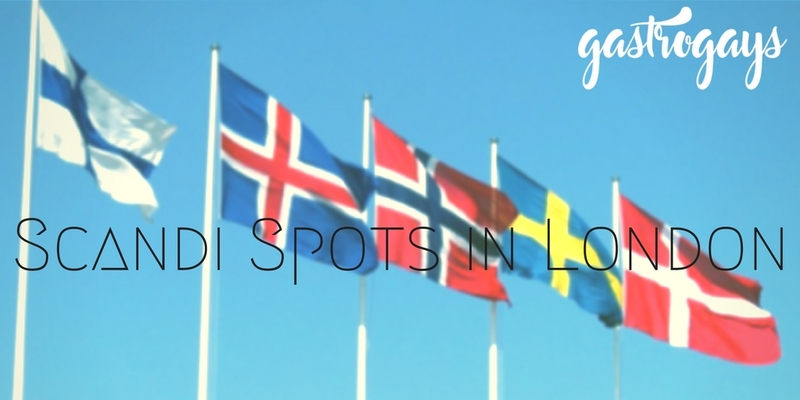 We know Iceland, Finland and other territories generally are considered ‘Nordic’, not ‘Scandinavian’, but for the benefit of this article (and the alliteration of Scandi spots; couldn’t help ourselves! ), we lumped them all together! 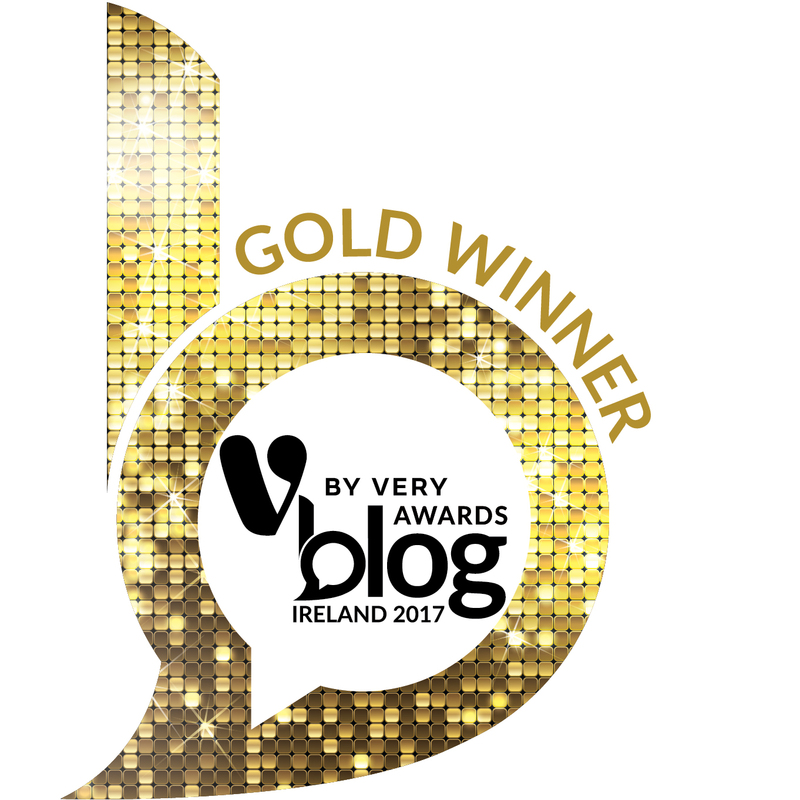 Plus, read on to the end of this article for a guest blurb from blogger ScandiNathan! Owned by a Dane and a Swede, this Great Portland café and food shop is revered by Londoners and European imports alike, famed for their open sandwiches, hot dogs and meatballs with cold salads as well as their kaffe och kaka. 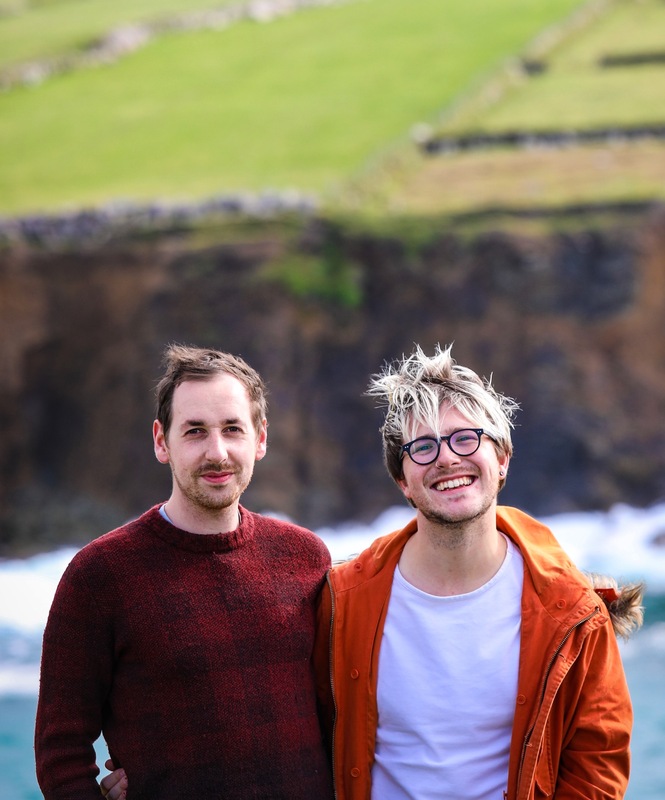 Its #ProudImmigrant owner Brontë Aurell commands this ship and celebrates all things Scandinavian, from specialist ingredient imports you can’t find anywhere else to raucous Eurovision celebrations every May with their own-produced score cards! We particularly love Brontë’s Scandinavian Kitchen cookbook and their social media and blog delivers Scandi tips, facts and tidbits daily! With a tagline of ‘Dark Rye Bread. Cinnamon Buns. Coffee’ you know instantly that Nordic Bakery takes ‘fika’ seriously. Nordic Bakery is a collection of simple, timeless, modern cafés serving uncomplicated food and drink in a snapshot of Scandi style. It’s really more than a café, though. A haven of calm in the busy city, they’ve consciously kept it minimal – the tableware and furniture are designed by iconic Finnish designers –avoiding visual clutter and encouraging noise to be kept to a minimum to ensure the purest, most serene Scandi café experience. With four branches (Soho, Marylebone, Dorset Street and Covent Garden), Nordic Bakery specialises in regional bakes and open rye bread sandwiches from the Nordic region, alongside pretty good coffee too. Having released a cookbook already, founder Miisa Mink launches Nordic Bakery’s first lifestyle book Font and Flavour, released in early May 2017. 18 chapters give a voice and profile to their customers, telling the tale of how their products are sourced and ideas conceived whilst enveloping the reader in what makes NB such a strong brand with a designer aesthetic. Flicking through, readers can discover how a specific preservation of Scandinavian sensibility and a distinct sense of style has amalgamated to create a space that is more than just a coffee house with breads and cakes. Not technically Scandi or particularly British, KuPP is a delightful find tucked away in the soulless sector known as Paddington Basin. Professing to provide “a little of what we love about Scandinavia proudly wrapped up in a big British blanket”, KuPP delivers aspects of Scandi style and cuisine in an easily digestible format for the British masses. Serious about coffee and particular about provenance, the team set up shop in a high-ceilinged, light-filled modern space creating one of London’s most unlikely ‘hygge’ hideouts in an area crying out for something different. Not perfect, the service can be very lax, but this is a welcome British-Scandi fusion that’s a real coup to have so close to the travel hub of Paddington. 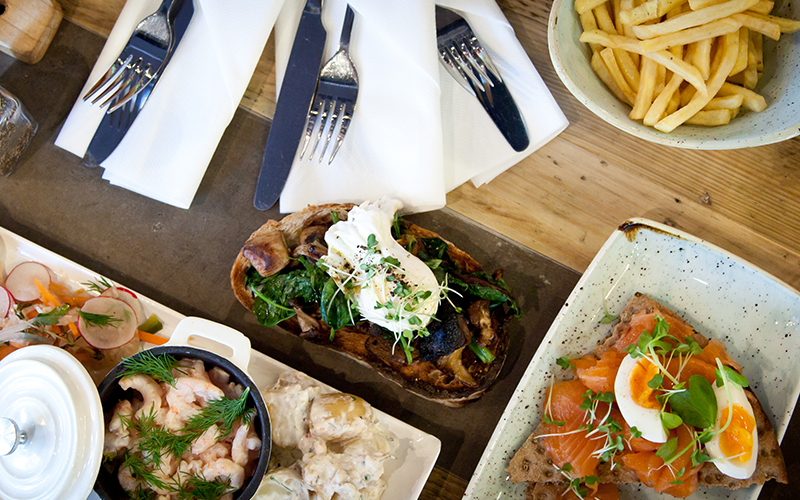 Translates as ‘taste’ in Swedish, SMAKA’s food is simple and honest with flavours reminiscent of a Swedish upbringing. Just off Whitechapel on Alie Street, enjoy Löfbergs coffee, loose leaf tea, homemade cakes and everything from breakfast and brunch to dinner. Seasonal and local where possible, British ingredients get a Scandi treatment with an emphasis on texture, colour and taste. Good one for a late evening coffee and cake date too – they stay open ’til 11pm, Tuesday to Sunday. 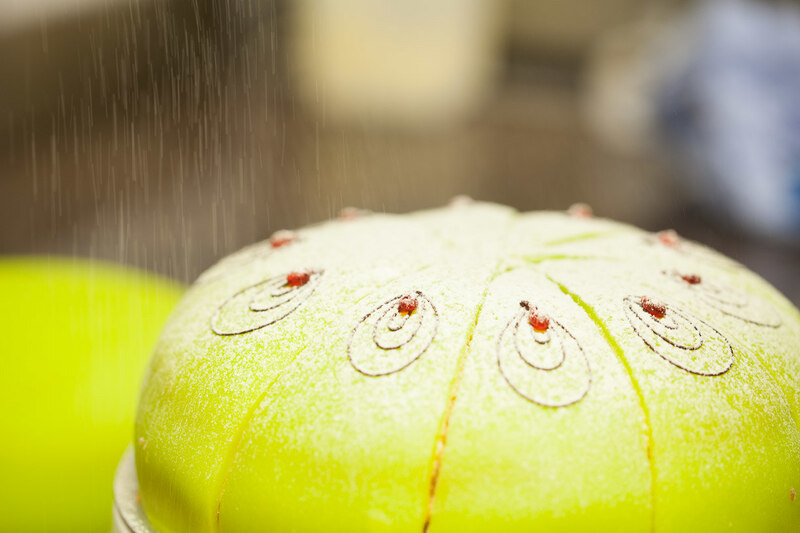 Bringing traditional Danish baking principles and olden-times recipes to the UK capital, The Bread Station in London Fields is a partnership between former Michelin starred chef Christoffer Hruskova and Danish master baker Per Brun. 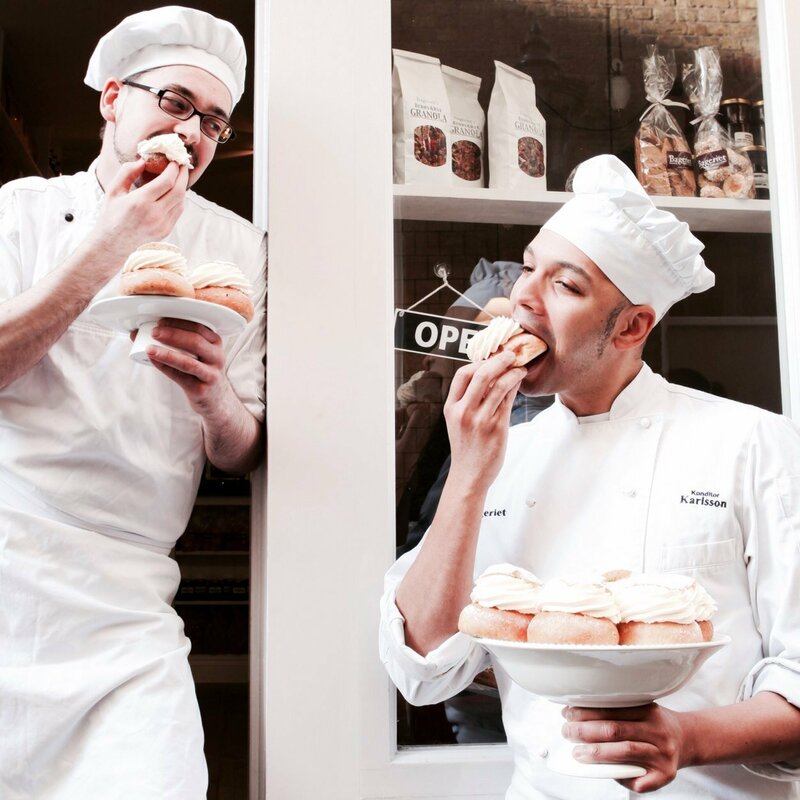 100% organic and yeast-free, The Bread Station’s doughs are made using grain that’s stone-milled right on site to ensure impeccable freshness. 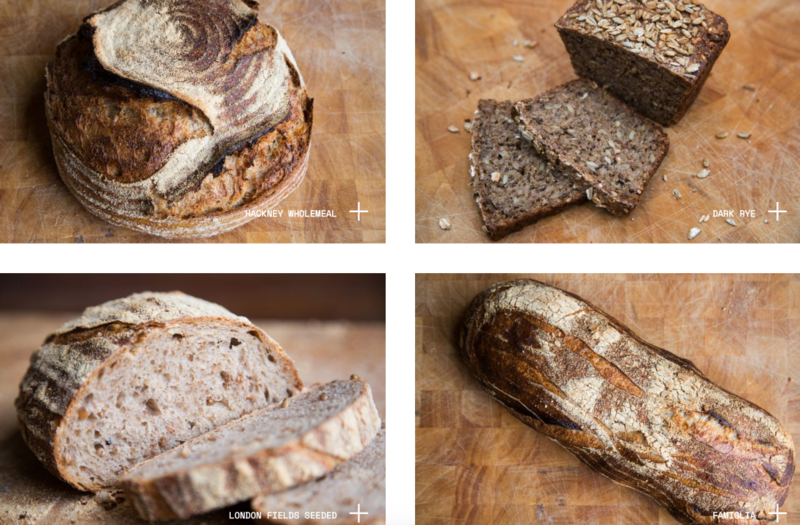 Sourdough is the star here and natural fermentation is the name of the game. It’s a business that’s set up to supply to the wholesale market but there’s also a little café (and small courtyard) serving the bakery’s spoils alongside Caravan coffee every day from early, early morning daily ’til early evening. Serving breakfast and lunch Thursday to Sunday, and dinner all week except Mondays, find some of London’s best frassvåfflor (waffles), pytt i panna (a Swedish hash-style dish), västerbotten cheese pie (a hard cow’s milk cheese from the area of the same name) here. The menu is a little expensive and it’s described as ‘Swedish tapas’, which we’re not quite sure about as it’s not small sharing plates, however they do offer a feast menu at £38 per person. The “authentic Viking way of dining”, it consists of large sharing platters, served family-style. A perfect place for Jul celebrations in the British capital. Though the original ‘Lisa’ has moved on, the business is in safe hands with a team of Swedish and non-Swedish staff ensuring it’s a Scandi sanctuary in west London’s Portobello Road. Passionate about hosting private events and filling the space with music, this Swedish space sure isn’t a shrinking violet. Tucked neatly on Bermondsey Square, you’ll almost blink-and-miss this emerald green outpost. A cute café with great coffee, juices, cakes and free, fast Wi-Fi, it’s the perfect stop-off if visiting one of the local markets (Borough, Maltby Street, Druid Street) on the weekends or a place to knuckle down and get some work done on a mid-week afternoon fuelled by coffee and cake. It’s not overwhelmingly Scandi, save for the name, but we can’t help love this little nook. It’s now also a coffee school too! A cute, picture-perfect Swedish bakery down a secluded side street in the heart of London’s iconic Covent Garden. Professing to have the best Semla buns outside of Skåne, Bageriet is a squeeze if sitting in but has lots of fresh bakes, hot drinks and packaged products to take away. 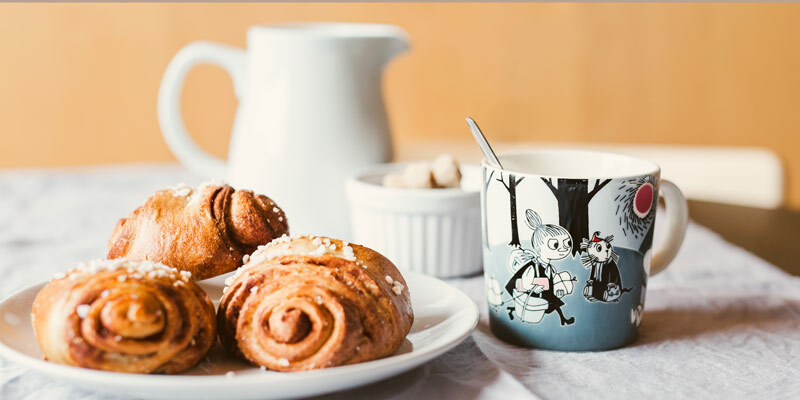 This café is especially on the ball for seasonal bakes, find lussekatt med saffran for the feast of St. Lucia, semlor at Lent, vörtbröd at Christmas and smörgåstårta for any celebration! 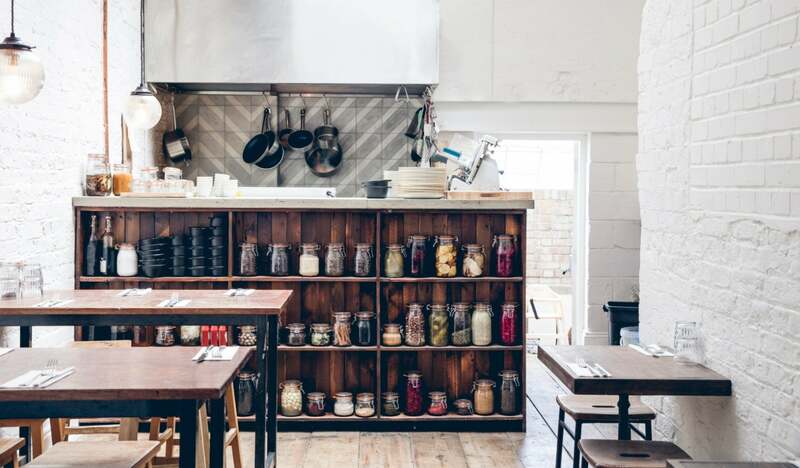 Self-described as London’s only Danish restaurant, SNAPS + RYE is a contemporary kitchen serving ‘proper’ Nordic cuisine focusing on produce and provenance founded by Danish-English husband-and-wife team Kell and Jacqueline Skött, sitting on Goldborne Road in Notting Hill. Breakfast and brunch is British-Danish fusion with rarebit and kedgeree available alongside Danish pastries, Skyr with berries and house-cured Var salmon with scrambled eggs on rye. Feast upon smørrebrød, veal frikadeller (meatballs) or house-cured herring at lunch (all around the £10 mark or less) and from Thursday to Saturday evenings they serve a four-course set menu (£37 pp) filled with weekly-changing dishes. SNAPS + RYE celebrates fresh, sustainable produce, supporting British suppliers but also import the best selection of authentic Danish food + drinks including Helt honey, Lakrids liquorice and Sealand Birk birch sap juice. 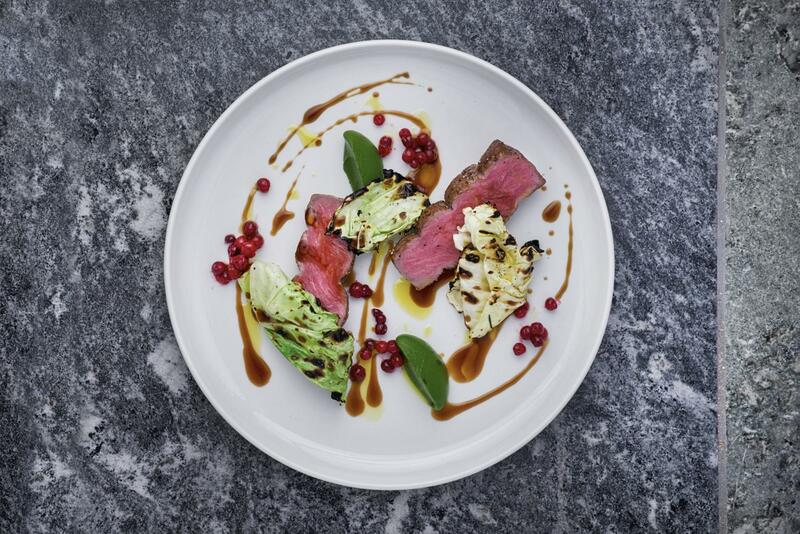 A contemporary – and delicious – corner of Denmark in London. Blåbär is a lifestyle and design shop with additional café, its name meaning ‘blueberry’, set along Lacy Road in Putney, southwest London. A British-Swedish partnership from Sandra Linnea West and Oliver Goodier, who fuse their individual experiences into this New Nordic space in Putney (and an online shop, too). Why the addition of a café? You know by now they are one of the focal points of Nordic culture. Goodier and West suggest you “come to relax for a few hours in our upstairs living room, do some work, watch passersby, or grab a coffee to go”. The organic & Fairtrade coffee and tea come from Stockholm’s Johan & Nyström whilst whole, clean food & treats come served on plates & in cups which are from their shop. Many of the materials have been bought over and re-used from Sandra’s family country home in Sweden. The idea is to create an environment to inspire and provide a full Nordic experience, which you can then take home. A Michelin-starred Marylebone restaurant from Icelandic chef Aggi Sverrisson. It’s an impeccably stylish, yet minimal and calm dining room on Portman Street serving high-end Nordic-style dishes using fine British ingredients. Interestingly from a country famed for its dairy products like Skyr, Sverrisson cooks with limited use of butter or cream for a crisper, more sharp and clean flavour. 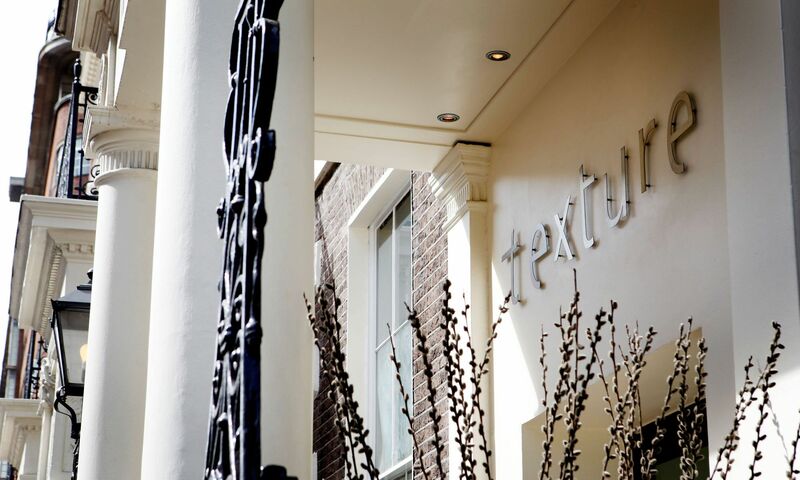 A five-course tasting menu (with appetiser and pre-dessert) is £95pp with five matched wines an extra £65pp. 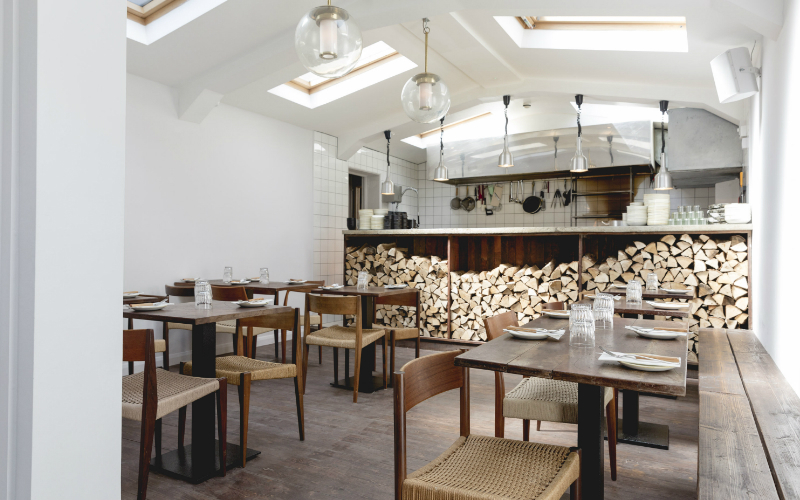 Rök Smokehouse specialises in Nordic small plates and lives and dies by simplicity and smoke. Influences come from old-style cooking techniques from the Nordics and brining and curing make up a big part of the menu, as does fermenting and cooking over fire. Seasonal UK produce fills the menu. 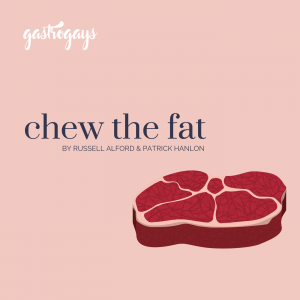 Now with two branches, each in one of London’s equally excruciatingly hip neighbourhoods – Islington’s Upper Street and Curtain Road, Shoreditch – regardless, this place has celebrated substance, lauded by some of London’s hardest to please restaurant critics. Another high-end Nordic dining destination in London. 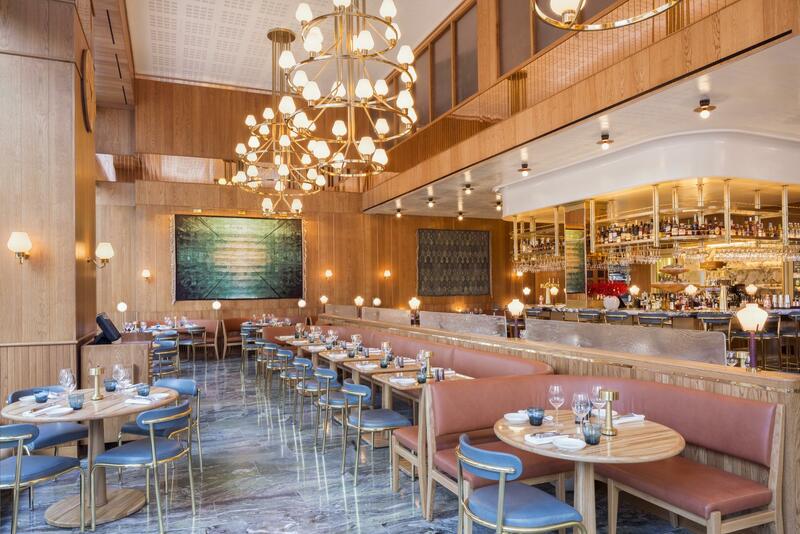 A younger counterpart of the Michelin-starred New York outpost in a slightly more relaxed setting (though to you and us, still in the stuffy confines of St. James’s). Former Lutyens chef, Henrik Ritzén is the London location’s Executive Chef, with the menu overseen by Aquavit New York’s Emma Bengtsson. It describes itself as a contemporary Nordic dining concept inspired by Scandinavian nature – water, seafood, game, hedge-grown berries, wild vegetables et al. The dining room is extremely elegant and the architecture and styling is given as much thought as the menu, with notable design details from Nordic designers Georg Jensen, Olafur Eliasson, Svensk Tenn and Ida Sjöstedt. Totally Swedish was the brainchild of two Swedish women living and working in London, originally starting out as an online shop, providing those products bearing the flavour of their motherland and important aspects of the Swedish cuisine and culture. Now, its gotten a pair of bricks and mortar bases with two shops, one in central London in Marylebone (not far from the Swedish embassy) and another in Barnes, southwest London. Both online and in-store they stock everything for your Scandi pantry from sill to lördagsgodis, canned korv to Kalles caviar, and kexchoclad bars to lakritsfabriken liquorice. The Ulrika Eleonora church is the heart of Swedish prayer in London, but it’s also the location of a good café and celebratory Melodifestivalen screenings! In the downstairs cafe you can drink Swedish Fairtrade coffee, read Swedish newspapers and eat homemade cinnamon buns. There is always someone to talk to as well as free WiFi and guest computers. There’s also community message and help boards. Just a street or two away from the Embassy of Sweden in London, it’s near to Edgware Road underground station and Marylebone national rail station. The Finnish Church (Lontoo Merimieskirkko) is based on Albion Street in Rotherhithe and also boasts a café serving Finnish food with a wide selection of products also available including Finnish sweets, frozen berries, rye breads, Auran mustard and pea soup. There’s also a Danish Church along a corner of Regent’s Park in north London and a Norwegian Church on Olav’s Square in Rotherhithe. The brainchild of Caecilie Hougaard Pedersen, a self-styled ‘Scandi in London’, bringing the signature open Danish sandwich to the masses. Combining classic and contemporary flavours, her personal take on the smørrebrød is quite literally popping-up all over London. Her beetroot cured laks is to die for! Recently having taken over the Penny in the basement of the Old Vic, Hygge Smørrebrød has started running ticketed Danish nights which are well worth attending. ‘Burger Joints’ have had something of a renaissance of late and it seems every street corner has a new ‘authentic’ burger place. Tommi’s offers the usual American-style burger experience but with a distinctly Viking take. It’s always rammed – first come, first served – and its stripped back interior sports raw materials, decorated and customised with an abundance of signage, pictures of the staff and customers, makes for a very þægindi (Icelandic for comforting) experience. The way the burger juices run down your fingers as you eat is a joyous thing! 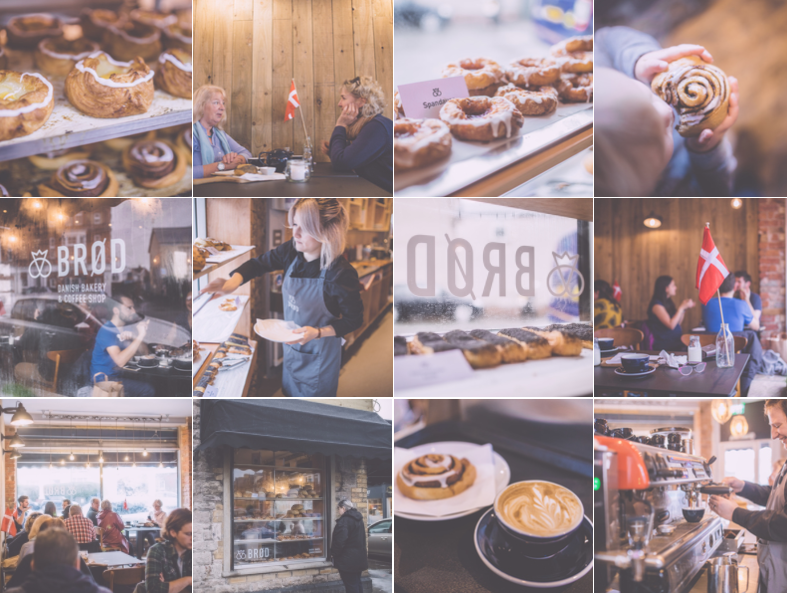 A Danish bakery in Cardiff selling a wide variety of authentic breads and cakes, Brød is the real deal. Betina Skovbro moved to Wales in 1998 and fell in love enough to stay but found the bread wanting, so therein lay the inspiration for Brød. There simply isn’t anything like it in Cardiff, or indeed South Wales in general, so if you’re in the vicinity then stop by to try the snegles or the wienerbrød and imagine you’re cooped up in a cafe in Copenhagen. Scandinavians are famed for their sweet tooth, none more so than the Swedes. They even have a name for the sweets they treat themselves to on a Saturday – lördagsgodis (literally ‘Saturday Sweets’). From the classic red liquorice Swedish Fish to rich and salty black lakrits, this long-established shop in Covent Garden offers everything in between. Inside, you’ll be forgiven for thinking you’d walked into Willy Wonka’s factory, which of course, was the intention all along. 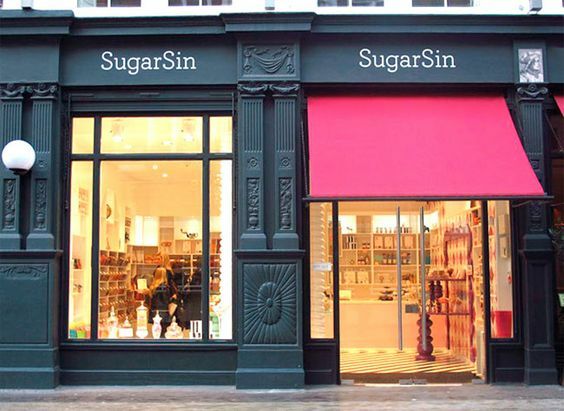 Lovingly run by Swedish sisters Anna and Josefin, SugarSin is a must-visit treat for all things sweet regardless of the day of the week. Now that IKEA have stopped stocking my favourite sweets, lemon lips, SugarSin is the only place in London to get them!